Is David Roentgen the 18th Century Steve Jobs? David Roentgen’s Game Table (ca. 1780–83). Oak, walnut, veneered with mahogany, maple, stained maple, holly, stained holly; felt; leather, partially tooled and gilded; iron and steel fittings; brass and gilt bronze mounts. Source: Metropolitan Museum, Pfeiffer Fund, 2007. Even if David Roentgen didn’t produce for the mass-market, he certainly seemed to have written Steve’s playbook — wow them with innovative design, refined surfaces, exacting craftsmanship, playful art, and sophisticated multimedia integration. Oh, and if that’s not enough, why not make it passkey protected and portable, too? Like Steve, David knew how to turn engineering into art and ka-ching. Experience out-of-the-box design innovation in the closing week of the Metropolitan Museum’s unforgettable show, Extravagant Inventions, Princely Furniture of the Roentgens. The beauty of the marquetry and fittings on the displayed desks, sofas, clocks, commodes, and rolltop desks would be enough, even if they simply occupied a quiet corner of a drawing room or boudoir. But if an 18th-century king, queen, or royal saw them in action – revealing hidden apps for writing, reading, drawing, music, games, curios, and hiding the desktop – there was no turning back. The mechanical furniture was so desirable that wealthy trend-setters just had to have it (like iPads). 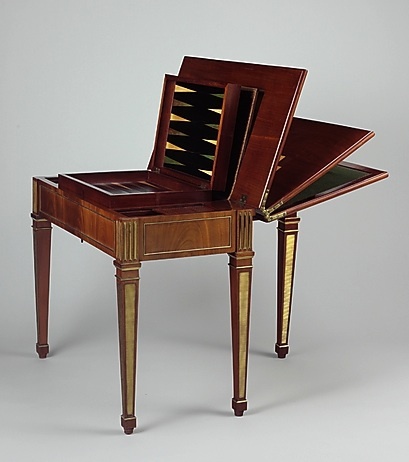 What social-minded gamer could resist Roentgen’s 1780s Game Table if they saw David’s demo? The desire to own and show off the most up-to-date artistic engineering marvel had royals running for their strongboxes to put down deposits on anything Roentgen could produce. In fact, the Met tells us that the Berlin Secretary Cabinet, the star of the show, is probably the most expensive piece of furniture ever produced. And we can’t even begin to discuss robot Marie Antoinette playing the dulcimer, or the clocks that turn into orchestras. When the French Revolution put an end to sales at Versailles, Roentgen cut out the curliques, tailored the outer design to a sleeker look, and shifted his retail operations to Russia. Catherine and her court bought the newer stuff by the cartload. The Met has an entire YouTube playlist devoted to these 18th century wonders, and you really should peruse them all. Get to the show in the final week and see what another style and multimedia-obsessed generation spent their money on. And lest it slipped your mind, Steve and Woz’s first Apple 1 computer was assembled within a wooden case. Maybe it’s good that David and his engineering/sales team weren’t around to critique it. This entry was posted in Art, Fashion, History, Museums, Social Media, Technology and tagged art, culture, design, history, marketing, museums, social media, style, video by mssusanb. Bookmark the permalink.